Homeowners will often try to tackle renovations and decluttering before calling a home stager, but it is actually better to call them in first. As soon as you have made the decision to sell your home, contact a qualified home stager to consult with you on what needs to be done to get top dollar. You may be planning for a renovation that will not yield a high return, and a home stager can help you to maximize your budget. We all know how many memories you can create while living in a home, but when it comes time to sell, it is important to think of the house as a product, and just like all products, it needs to be marketable in order to find the right buyer. This can be challenging, especially if your reason for selling is not a positive one, but focusing on the process will help. By packing up your items, you will find the moving process much less stressful, and you can keep all of your private memories…well…private. Be sure to select the right home stager for you. Who understands your market best? Who offers the type of service that is right for your home? What does their portfolio look like? Do they have what it takes to properly showcase your home? Be sure to check out reviews and testimonials, ask for referrals from your friends and family, and review their home staging portfolio. By asking the right questions, you can ensure that your home is in good hands. Your house is generally your largest investment, so why would you trust that to just anyone? Ask what professional training and certification your home stager has received. Are they associated with an accredited association or organization, such as RESA? What awards and credits have they earned? Hiring a qualified professional will help to ensure a positive outcome for your home. Keep in mind that home staging is NOT the same as decorating or designing a home, so choose your home staging professional based on their home stager training and experience. They may also provide decorating and design services, but they should have the qualifications needed of a home stager as well. Allow your home stager to create a design plan that works for your home and your target buyer – keep in mind that this may not be to your personal taste, but trusting in their expertise will yield the greatest return on the sale of your home. Questioning their vision could lead to compromises in the design, meaning that your home will not showcase as well, and it could delay the process. This is the best way to ensure that you maximize your investment in home staging. With the right marketing, and quality photography, your home can receive maximum exposure and make your home’s greatest features really shine. Every home stager will have a different process, different pricing, and different packages. Be sure that you fully understand what your investment will provide you with (i.e. staging report with recommendations, staging rentals, access to trades, etc.) and what it does not include (i.e. house cleaning, repairs, etc.). Quite possibly the biggest mistake that is made, especially when planning a house-flip, is over-renovating. Not all upgrades are created equal! Be sure to consult with your home stager before beginning any renovations on your property – they will assess the best value to allow you to maximize your budget, and invest in the updates that will produce the greatest return on your investment. As the saying goes, you generally get what you pay for. Selecting the cheapest stager in town could cost you more in the long run if the house takes longer to sell, between additional carrying costs, price reductions, not to mention the stress of having your house available for showings regularly. If a home stager’s price is lower than the industry standards, there is likely a reason. 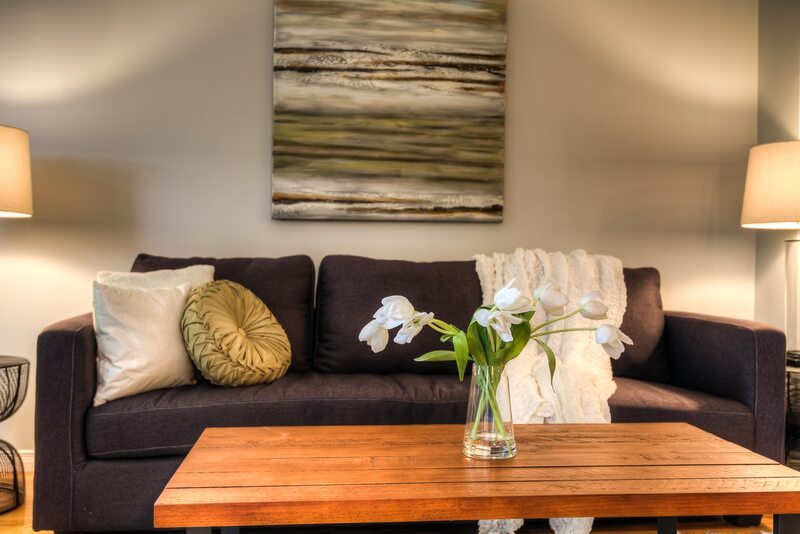 Don’t get caught up in the design details – leave that to your professional home stager! The better that you follow their recommendations, the faster the home sale, and the more money you will get (we know that this is cliché, but it really is true!). You wouldn’t clean your own teeth, would you? So why would you try to stage your own home? Your home stager will provide you with recommendations that are specific to your home. If you are planning to live in your home for the time that it is listed for sale, your home stager will likely aim to work with most of your own furniture and decorative pieces, if they feel that these work well for your target buyer. If you are eager to get started and begin the purging and decluttering process, be sure to keep some non-personal decorative items out for your meeting with your home stager, in case they would like to work these into your staging plan. These may not fit into the final staging plan, but it is best to allow your home stager to make that decision. This can be just as dangerous as over-decluttering. Remember, home staging is not decorating. Creating a decorating plan for a home is about infusing your own personal style and choices, whereas home staging is intended as a marketing tool, drawing the buyer’s eyes to the greatest areas of interest. When it comes to staging your home for sale, less is more. Consult with your home stager to ensure that you get the balance that is just right for your home. Review any major renovation decisions with your home stager before finalizing your plans. It is your home stager’s goal to ensure that the money that you invest in your house is spent in the best areas for increasing the overall sell-ability of the house, creating a move-in ready home, and providing you, ultimately, with the greatest return. If you have selected some new finishes that you feel will work well in your home, such as flooring, countertops, cabinets, light fixtures, etc, aim to have samples available at the time of your consultation for your home stager to review. Quality takes time, and Rome wasn’t built in a day! We get that in real estate everything needs to happen yesterday, but taking the time to complete the recommendations made by your home stager BEFORE listing your home for sale will pay off in dividends in the end. Creating a finished product, ready for sale, will provide better results than rushing to market with the “lipstick on a pig” version. If you are planning any renovations prior to selling, allow yourself sufficient time to create the proper plans and to execute. Also, keep in mind that it is not uncommon for renovations to fall behind schedule, due to unforeseen circumstances, so be sure to allow yourself a buffer of time between completion of the renovations and any staging that needs to take place before listing the house for sale. Interested in a career in home staging? Find out what our Real Estate Staging Professional (RESP®) Certification program is all about! Have questions about becoming a Home Stager, or just starting out and need an extra boost in your business? Join our Facebook group, To Be a Home Stager – our very own Shauna Lynn Simon is live online every Thursday afternoon, answering your most pressing questions! Webinar: Organizing Your Business to get it Working for You! Home Staging Certification – What is it, and Do I Need it?